Rep. Maxine Waters (D., Calif.) said Wednesday that the Democratic Party is "not a socialist party," making her yet another Democrat pushing back against the party being defined by the rise of democratic socialism. Speaking with CNBC's John Harwood, Waters objected to the idea Democrats have embraced the mantle of socialism. "I think that's an exaggeration. The Democratic Party is not a socialist party," Waters said. "And because we have some very—aggressive, smart people who would like to create some changes, who may represent the extreme end of our party—"
According to a transcript, Harwood pointed out two prominent democratic socialists in Sen. Bernie Sanders (I., Vt.), who caucuses with Democrats, and Alexandria Ocasio-Cortez, the New York congressional candidate who upset Rep. Joe Crowley (D., N.Y.) in his primary last month. "Yeah, but he votes for Democrats," Waters said. "And I just don't think that our party should be identified because we have a few people who seem to be to the left of the left." Waters said she considered Sanders "basically a Democrat" who focuses on Wall Street. Asked if she was a capitalist, Waters responded, "Of course I am." 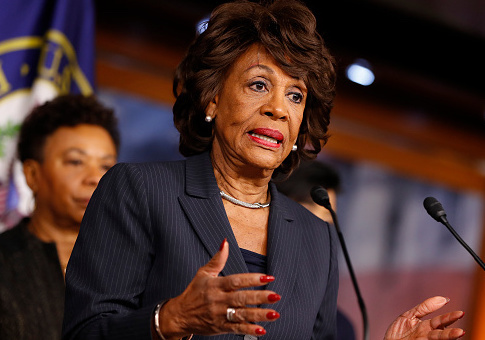 Waters has become a national figure since President Donald Trump took office, frequently calling for his impeachment and also saying his opponents should gather up crowds to harass his Cabinet members. Harwood asked another leading Democrat in Sen. Elizabeth Warren (D., Mass.) about whether capitalists were bad people, to which she responded, "I am a capitalist. Come on!" This entry was posted in Politics and tagged CNBC, Elizabeth Warren, John Harwood, Maxine Waters. Bookmark the permalink.